You are here:Home » Other » Happy 3rd Birthday WagerTalk (plus, a special gift from Marco)! WagerTalk.com turns 3 years old tomorrow. It’s been a fantastic 36 month journey so far. In just three years we have seen the site grow so much. We had our own National Radio Show on the SB Nation Radio Network taking Vegas to a national audience, a daily radio show on ESPN Radio in Vegas and providing sports betting content for Bar Stool Sports. WagerTalk has been featured in OZY, Sports Illustrated and in an upcoming NFL betting preview in GQ Magazine. Scott Spreitzer, Marco D’Angelo, Ralph Michaels and Sports Cheetah are regular guests on some of the biggest shows around the country such as Dari & Mel Show with Nowkhah & Kiper, VSIN, Roc & Manuch with Crespin, Double Coverage on WWL in New Orleans, ESPN Radio Omaha, Mad Dog Radio, The Fanatic in Arizona and many more! It’s just the beginning as WagerTalk.com has more big things planned down the road, including our new smart phone application and some exciting partnerships to be announced in the coming months. But through it all the past 3 years couldn’t have been possible without you our loyal customer. I want to say Thank You for supporting WagerTalk.com during our first 36 months. To celebrate our first 36 months we are offering an unlimited use 36% discount on our Pick Your Team Program (saves up to $214.20), 1 day Power Pass (saves $35.64), 1 Week Power Pass (saves $143.64), 1 Month Power Pass (saves $359.64), every daily, three day (saves $21.24), weekly (saves $35.64), monthly (saves $107.64), 90 day (saves $215.64) and yearly package (saves $575.64). Take advantage of this coupon to save on pretty much EVERYTHING at WagerTalk but seasonal sports packages and WagerBuxx packages until midnight of the 29th. There is no limit to uses and it can be used on every single WagerTalk handicapper as many times as you want. It’s just my way of saying THANK YOU! Simply use Coupon Code: HAPPYBIRTHDAY3 when you checkout and you will receive a 36% discount. Added Birthday Bonus: Each use of this coupon until midnight of the 29th gets you ONE ENTRY in a drawing (winner will be announced on twitter and notified via email) for a full month of Don Best Platinum Odds ($499 value)! 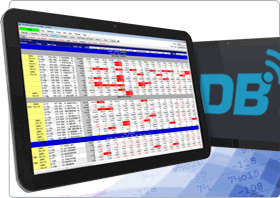 Don Best is the industry leader in odds provision, Don Best has exclusive rights to real-time data from leading North American facing sportsbooks. We get you the data that others cannot.